Straight Snap-In Fittings - Bolt Products Inc.
Snap-in Connectors are UL approved for use with Heyco-Flex II tubing. NPT-threaded connectors are UL approved for use with Heyco-Flex; I conduit. 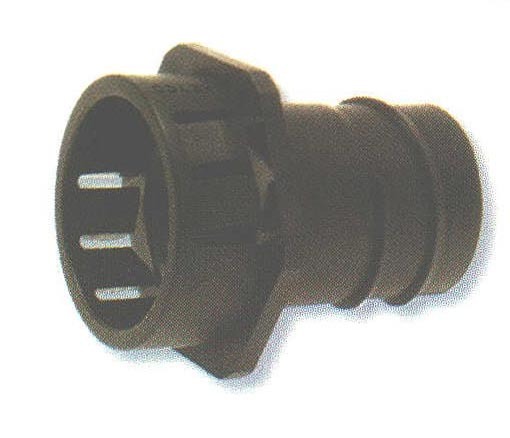 Low cost electrical connector in four sizes (1/4, 3/8", 1/2", 3/4"). One-piece solution with smooth internal surfaces provides for easier wire routing, protection, and installation. All nylon construction is resistant to salt water, weak acids, gasoline, alcohol, oil, grease, and common solvents. This feature is not assessed by UL certification and testing. Easy, permanent assembly: the installer “twists” the tubing over the connector ferrule, until the tubing “clicks” into place. It’s that easy! Unique locking fingers accommodate various chassis thicknesses. Also available : Black and gray finishing collars to neaten rough cut tubing ends (not available in 1/4"). Recognized under the Component Program of Underwriters’ Laboratories File #E121095."